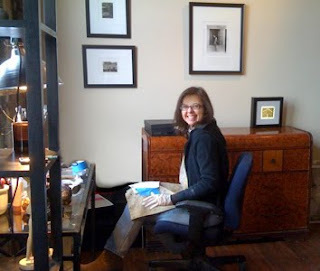 I am finally settled into my new studio, I still have a little organizing to do. But I’ve already started printing in the darkroom which is a delight from working in my bathroom at home. I recently picked up a camera studio stand which will make shooting almost effortless with an 8x10 camera. Soon I will be starting a couple of new photography project that I’ve been wanting to do for awhile, now with the studio it makes it all possible. Some of the projects require a little set building…can’t wait! It’s also been delightful sharing the space with a person working in a totally different medium but in the same subject matter. Audry’s recent collected works are comprised of cast-bronze. Now with the new studio she’s planning to cast larger pieces of work. It’s been amazing to watch the whole process. Stay tune for news on our open house party which will be in a few weeks. I would like to sprint around inside and do cartwheels. Just thought I'd let you know. It looks amazing!